Why We Are Getting Married in ..
Top Five Things to Do in Stock..
Only have 48 hours in Montreal? When it comes to planning out a short trip to Montreal, strategy is key. Don’t let Google Maps fool you—no matter how close they look, most attractions are over thirty minutes apart by foot! Not trying to break a sweat? Opt for Uber or a subway ride. During the harsh winters, avoid the biting cold by using the extensive underground tunnel network that runs below the city. Waiting for summer? Be wary of suffocating humidity. The best time to visit in March to May or September to November. In a nutshell: New York versus Montreal bagels: your call. The hip neighborhood known as Mile End is home to two of the city’s greatest legends, which both happen to be bagel shops. 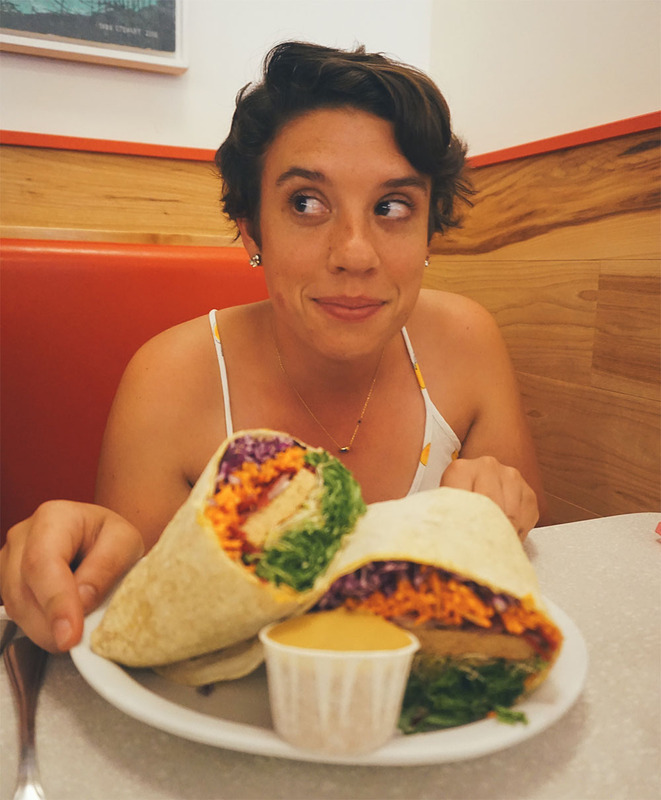 What’s so great about Montreal’s bagels? Traditionally, Jewish bagels are boiled in water before they are baked to give them their shine and chewiness. But unlike New York bagels, Montreal-style bagels are dropped in water sweetened with honey before being baked in wooden ovens yielding a less doughy, smaller, and crispier bagel. Bagels are served fresh out of the oven 24 hours a day, 7 days a week at both Fairmount Bagel and St-Viateur Bagel . Don’t be surprised if you find yourself walking out the door with a bagful. 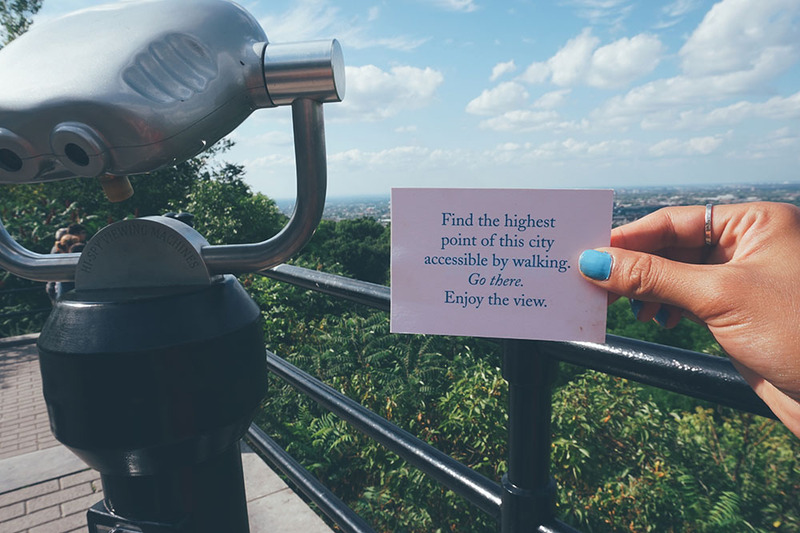 Weather permitting, take a hike up Mount Royal—Mont Royal in French—which is more of a hill than it is a mountain, to see just how far reaching Montreal’s city limits extend. At the foot of the mountain is the George-Étienne Cartier Angel Statue . To the left, you’ll see a public building and a sign that reads “Quartier General” marking the beginning of the hiking trail. A few minutes on a gravel footpath, there will be a wooden staircase leading all the way up to the larger, more popular Kondiaronk Belvedere (a fancified word for lookout) next to the Chalet. The total hike time is about 20 minutes one-way. On the otherside of the mountain is the smaller, but car-accessible Camillien-Houde Belvedere . The views aren’t that great but in the summer, there is an open-air cafe called Cafe Suspendu , which sells wine, paletas (Mexican ice pops), kombucha and has wooden swing sets and books scattered indiscriminately. 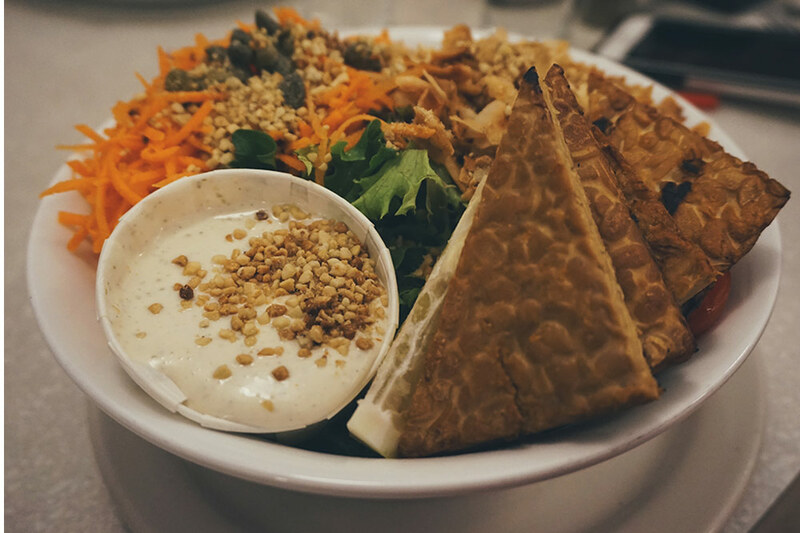 After your mini-hike to the top of Mont-Royal, maintain your healthy streak at Aux Vivres Plateau , Montreal’s first vegan restaurant. The menu is brimming with creative vegan interpretations on ethnic cuisine and they also offer weekend brunch specials. The cheerful space and attentive waitstaff allow you to mellow out to the tempo of a groovy, relaxed playlist. Spiced chickpeas drenched in a creamy coconut gravy is their take on the Indian delicacy, Malai Kofta. It’s frankly one of the best appetizers I’ve eaten. Word to the wise: don’t over order. There’s a lot of food. A true food lover? 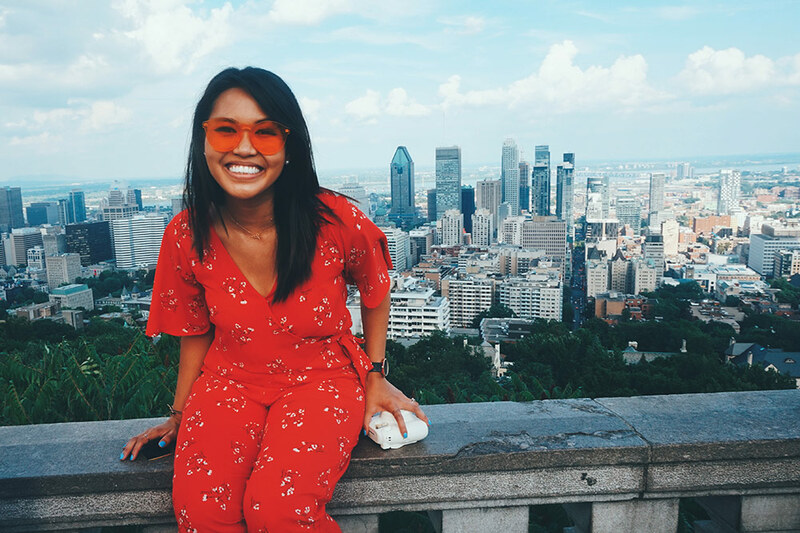 From the base of Mont-Royal, hail a taxi or call an Uber to visit a Montreal itinerary staple: Le Marché Jean-Talon (Jean-Talon Market) . The public market in Little Italy has a wide array of regional products from all over the province of Québec. There are some treats you won’t find anywhere else in Canada so sample everything, especially if it’s in season! 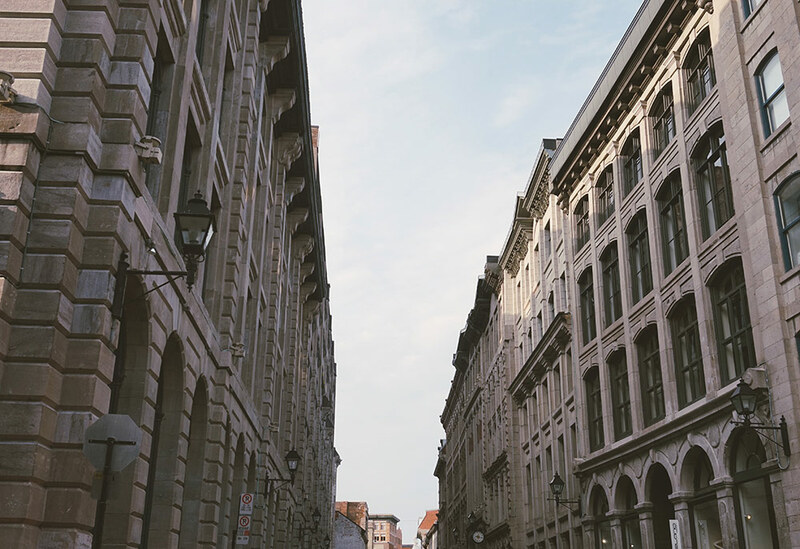 A visit to Montreal would not be complete without promenading through the rugged, cobbled passageways of Old Montreal . The oldest neighborhood in Montreal and its charming 17th century architecture hint to the refinement of New France. 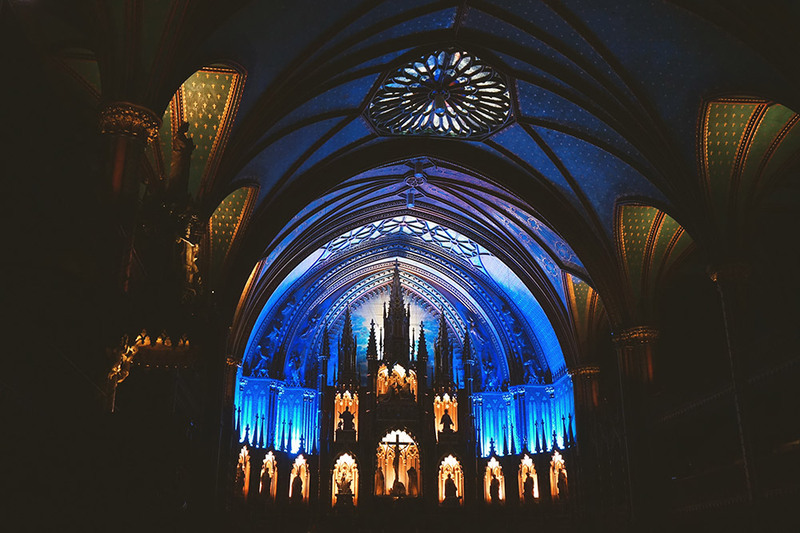 After a stroll down Saint-Paul Street, step into one of the most stylishly, sacred places in the world: the Notre-Dame Basilica . Vaulted ceilings dressed in shades of royal blue and flecked with stars of gold are but a small taste of its opulence. If you are not attending mass, visitors must pay an entrance fee of CAD $4 for children/6 for adults. In the evenings starting at 6 pm (calendar subject to change), you can reserve a ticket for an epic lightshow called AURA, which canvases the sanctuary in laser projections of Biblical moments synced to Gothic choral music. Kind of spooky. Buy tickets online for $24.50 CAD. AURA is only 45-minutes long and sit in the middle for the best view. If you’re not watching the show, get there before 4 pm, when the cathedral closes to the public. Two nearby dinner options are Stash Cafe , a longtime running Polish restaurant with live jazz music and church pew dining. Get the pierogis! 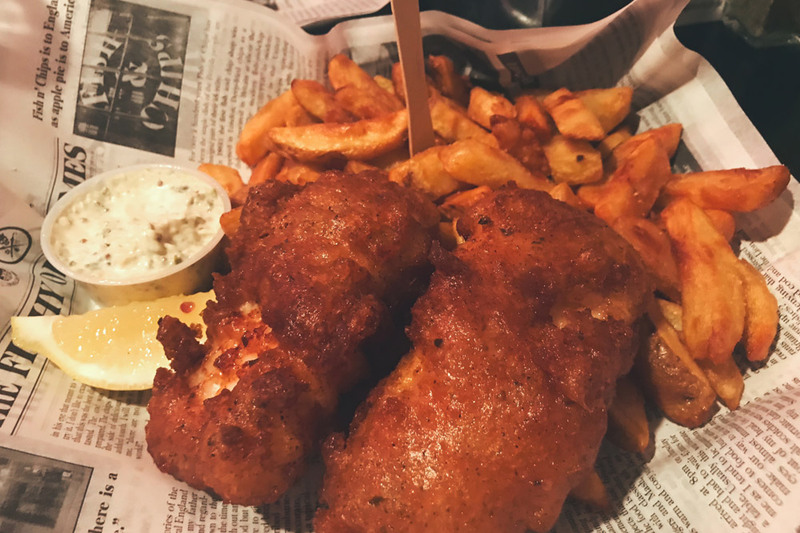 Down on Rue McGill, check out Brit & Chips for the tastiest platter of fish and chips this side of the pond. I may actually get beat up for saying this, but this could honestly be the best fish and chips I’ve had period. I loved it so much, I ended up eating there twice. Ready to hit the town? Don’t do it immediately after dinner. Most nightlife spots don’t get busy until after midnight. So relax. Freshen up. Nap. Invest in an energy drink. Do what needs to be done so you have the stamina to endure a long night ahead. If this is your first time in the city, go big or go home. La Champagnerie is a champagne-centric cocktail bar and a fan favorite with bachelorette crowds because brides can saber open their bottles of bubbly. Fancy knife work = always a crowd-pleaser. Bord’Elle is a boutique eatery and bar and for a steep price tag, you can eat glamorously with aerielists dangling from suspended hoops overhead. Drink at either one of these bars before queuing up for the classiest dance club in town, La Voute . La Voute is for the fashionable, so dress to impress. Ladies, get there early enough and you’ll be treated to donuts and champagne in the girls bathroom. Enjoy the freebies while they’re still clean. A mecca for house music, techno heads won’t stop raving about Stereo Nightclub . But Montrealers know that Stereo is THE flagship club for all-night dancing. The massive three-floor venue continues to attracts crowds for its afterhours set list, ample seating space, and impressive sound system. Don’t be surprised if you wake up deaf. After a late night out, chances are you want to take it slow this morning. A good way to take it easy while still not losing out on the day is an excursion to the Museum of Fine Arts Museum (Musee des Beaux-Arts) . The 12th most visited museum in North America, anyone 30 and under is given free access the permanent collection! Grab a coffee from the museum shop and work your way through the several buildings that make up this museum. If you have a raging hangover and are desperate for a cure, try your luck at Ming Xuan Tao on 451 St Sulspice Street. The teahouse is owned by an austere gentleman passionate about his trade. 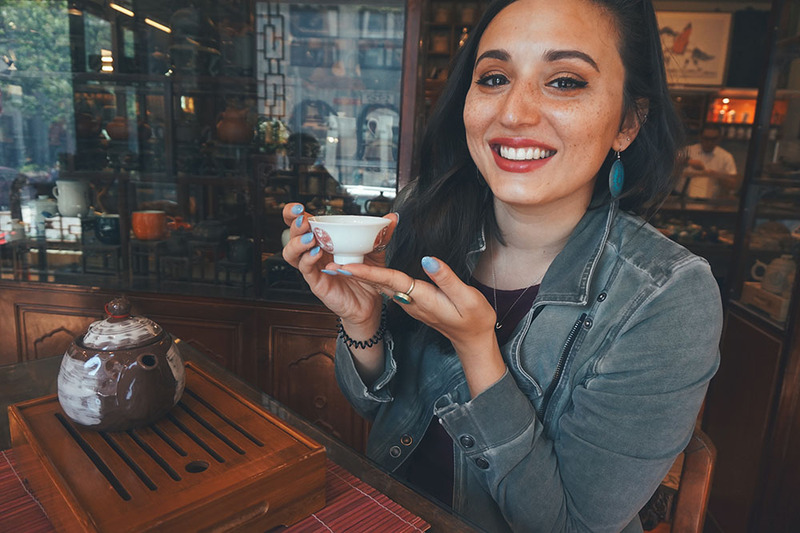 From promoting circulation to making your skin glow, the teas are said to have medicinal properties. 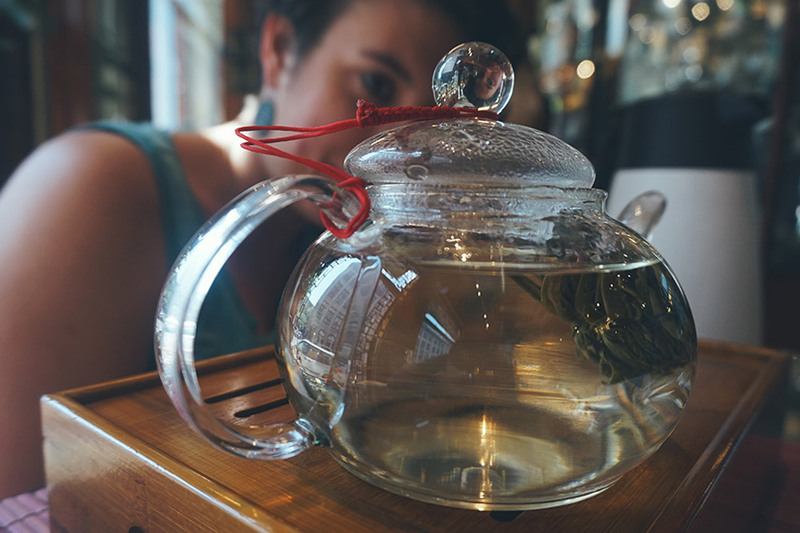 If anything, you can zone out while watching the blooming teas blossom inside a transparent teapot. A true art lover? 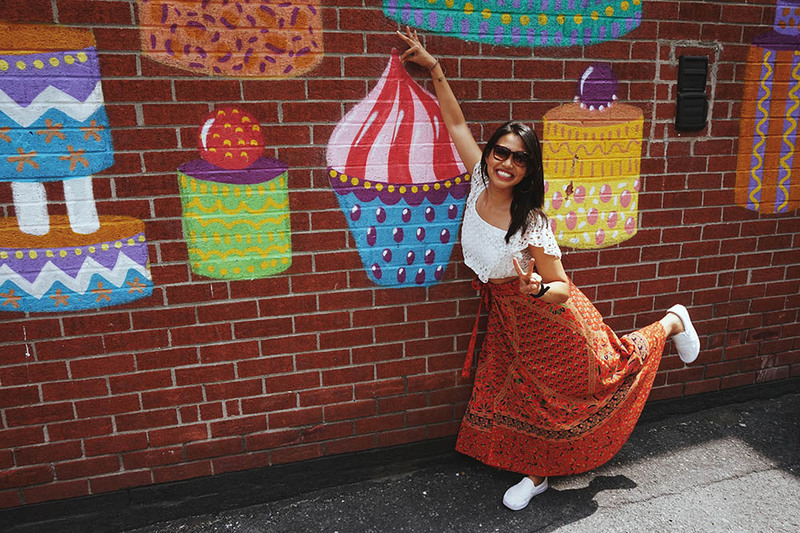 Montreal is home to a thriving art scene. 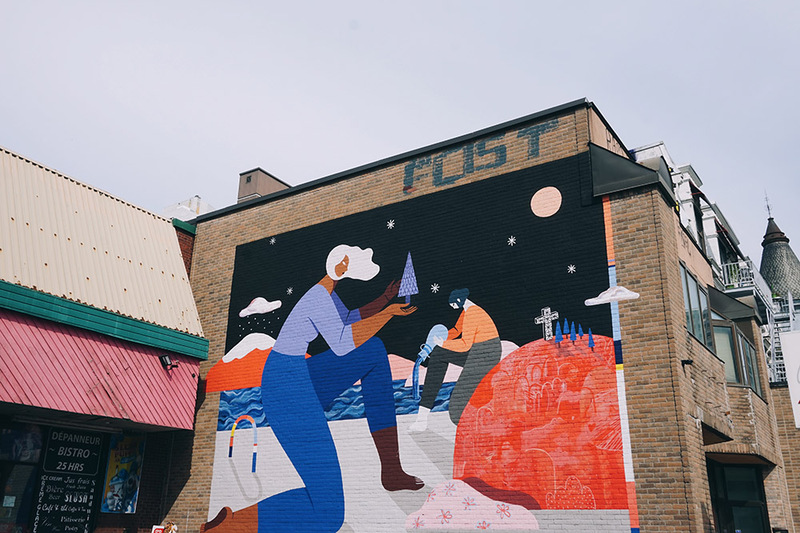 From the standard brick and mortar museums to streetside art and music performances, in summary, Montreal is one big artistic showcase in and of itself. Creative highlights include: Osheaga, a multiday indie music festival that happens every summer across multiple stages; La Guilde , a non-profit gallery displaying contemporary mixed-media work from First Nations artists; and Arts Café in Mile End, a local coffee shop that attracts aesthetes looking to feed mind, body, and soul. Along with bagels, the Jewish legacy in Montreal includes the gift of smoked meat. Schwartz’s Deli reigns supreme as THE Jewish delicatessen to order up a bulky smoked meat sandwich. What is smoked meat you ask? Smoked meat is pure, unadulterated brisket cured for up to two weeks in a peppery brine and is then smoked for 6-8 hours to create a seriously juicy slab of beef. Order up a Montreal smoked meat sandwich either “fatty” or “medium-fat” to experience the tender, elaborately spiced greatness of a Montreal classic. 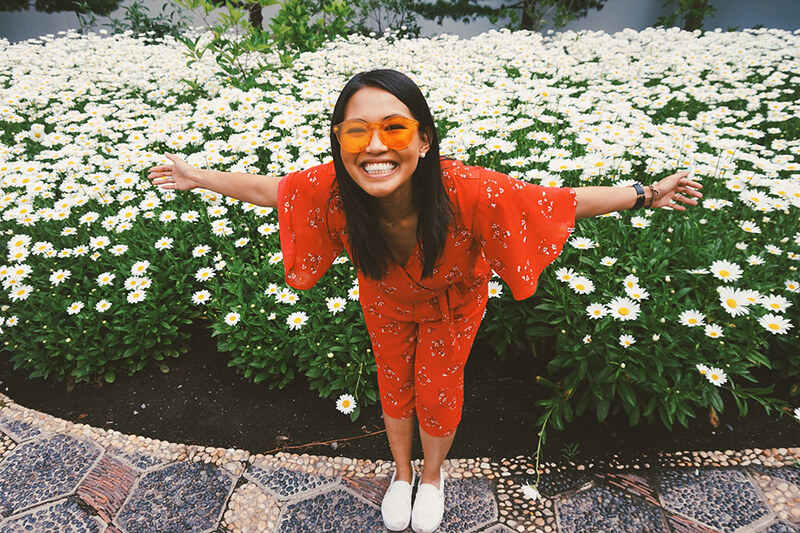 Stop and smell the roses. The Montreal Botanical Garden , right across the street from the Olympic Park, is a biodiversity haven and one of the world’s largest botanical gardens. The gardens display a collection of over 20,000 plant species, 10 exhibition greenhouses, 20 thematic gardens and 3 cultural gardens. 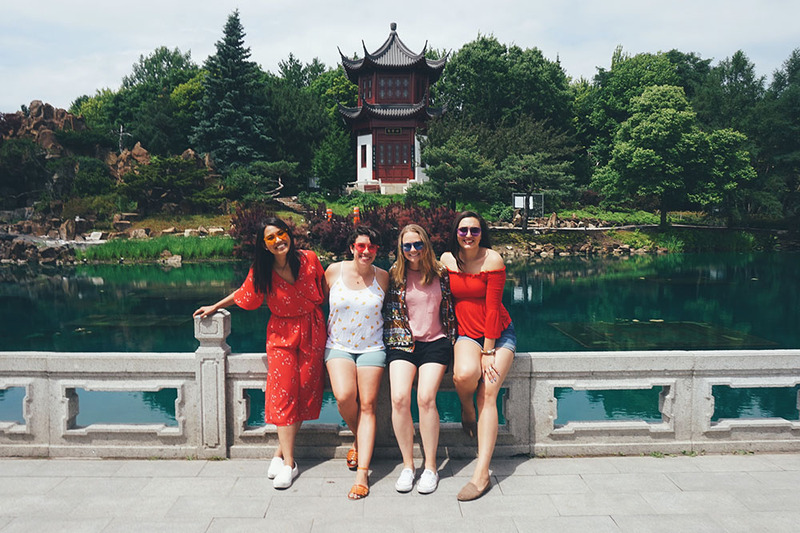 The cultural gardens were by far my favorite—the Chinese Garden was a replica of an imperial garden from the Ming Dynasty and they didn’t miss a single detail, going so far as to include a teahouse where parkgoers can enjoy fresh herbal brews. A single adult ticket for $20 CAD ($15 CAD for students) allows you to explore all this, and even the arboretum with miles of walking paths. The Montreal Botanical Garden is part of the “Space for Life” project, which also includes the Insectarium, Planetarium, and the BioDome closed for renovations until 2019. 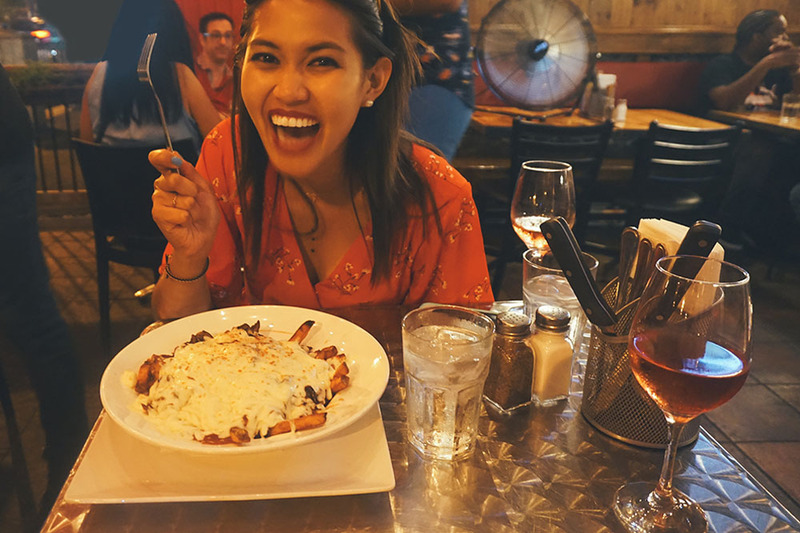 You can’t leave Montreal without trying the city’s most popular export, poutine. 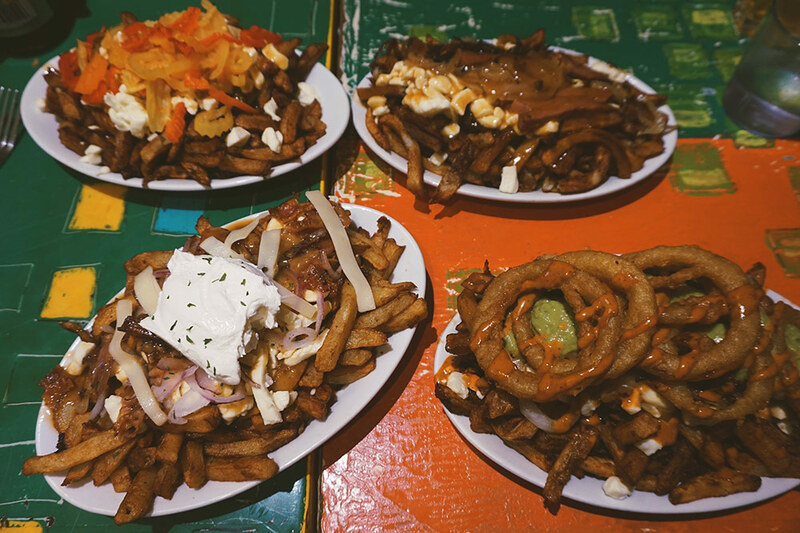 La Banquise is the preeminent poutinerie in town, serving up crazy variations of the iconic Québécois fare. The standard recipe calls for french fries topped with gravy and cheese curds (not ordinary cheese—this is a critical distinction). Here at this all-night diner, the toppings run anywhere from sliced hot dog chunks to guacamole. My favorite was La Savoyarde: bacon, onions, swiss cheese and sour cream poutine. The regular size is enough for two people, but depending on how drunk you are, you might want to upgrade to grande. There is indoor and outdoor seating as well. The establishment is cash only but there is an ATM at the entrance. A close runner-up to La Banquise is Poutineville on 5145 Park Avenue. They take a more gourmet approach to poutine by mixing the cheese curds with mozzarella and they happily let me customize my order. I asked for classic poutine with caramelized onions and swiss cheese and when it came out, there was a blanket of melted swiss cheese keeping my poutine warm. Cap off the weekend at Dieu du Ciel , a Mile End microbrasserie with a growing reputation for their homebrews. 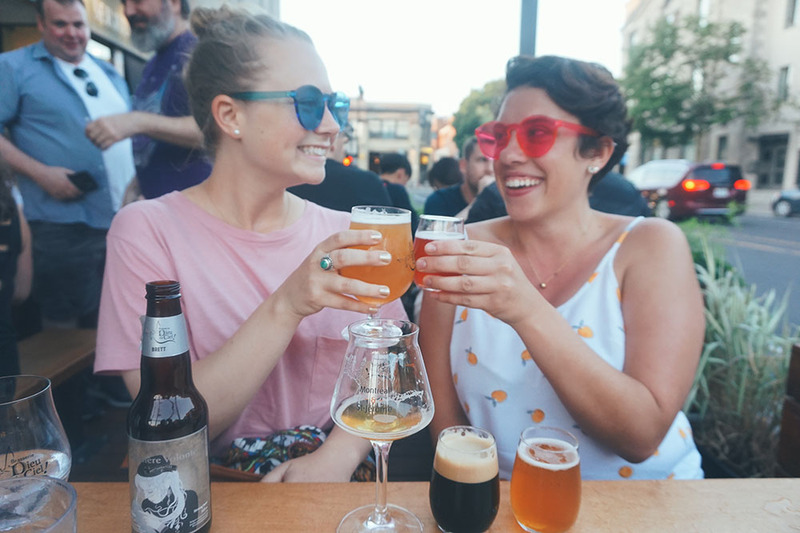 The drinks menu is small, and the food menu is even smaller (although they do have a good assortment of charcuterie boards), but undoubtedly, its their elect selection of beers that keeps Montrealers coming back for more. Non-beer drinkers, you can choose between a few wines and water. To your health! À votre santé! AND HERE’S A MAP OF ALL THE 17 POINTS OF INTEREST! 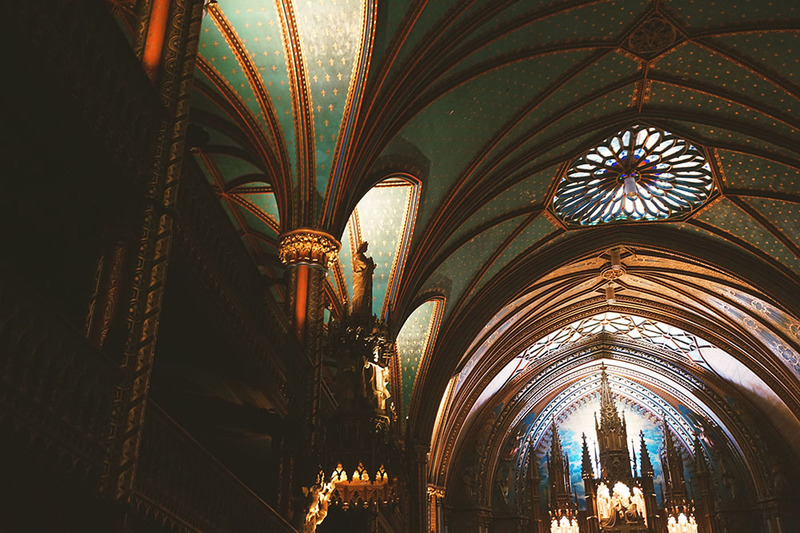  Is there anything you would recommend if you only had 48 hours in Montreal? Share your must-dos in the comments below!